length. I wore orthotics for 15 years and decided 1.5 years ago to get out and transition down to a more minimal shoe. While I've done this I'm suffering from a lot of ankle issues. Really the longus and brevis seem to be problematic. I'm not a runner but even trying to walk a mile a day seems to over stress them." 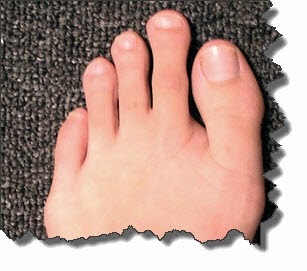 If the space between your first and second toe appears to be deeper, not wider, but deeper than the space between your second and third toes, you have Morton's Toe, also known as Morton's Foot. do not think metatarsal discrepancies are really that much of an issue in themselves; the real issue is to do with foot strength and foot hardness. When I look at the feet of some of my Samoan in-laws, I see strong feet that are perfectly adapted to their environment. They are not necessarily the most beautiful of feet; but they sure can take a whole lot of punishment. The problems I see daily with foot pain are closely associated with soft, weak feet which are the product of a lifetime in shoes from birth. This sheltered upbringing of one's feet is not usually a problem until the owner starts to put on a bit too much weight, takes up a fitness programme, or - heaven forbid - starts preparing to run a marathon wearing minimal shoes! Matters may also be complicated by nutritional deficiencies and unwanted side effects of medication. Get about the house and office barefoot - wear socks. I do so all day while at work. Walk barefoot often on natural surfaces such as grass, river gravel and sand. Do daily exercises to strengthen the arches of the feet: Google search: "Gary Moller Correcting Foot Pronation". Keep your weight on the lean side: every excess Kg is a huge stress on the feet, especially when standing, walking and running. Bathe tired legs and feet in a tepid Epsom Salts foot bath. Google search: "Gary Moller Sore Feet". If planning to exercise in "Barefoot" shoes, make the transition from conventional footwear very gradual. If you have a history of "weak feet" it may be better to use conventional sports shoes for the heavier exercise, including longer running and walking and use the barefoot shoes around the house and yard. Many medications may accelerate arthritis with long term use. These include asthma drugs, many blood pressure drugs, drugs for thyroid disease, drugs for osteoporosis, all steroids and most anti-depressants. If you are taking any medication and you are beginning to suffer unusual joint and/or muscle pain and stiffness, then the role of medication must be suspected and explored.